by jamesc 8/31/2018 8:38:03 AM -- NORFOLK, NE – Northeast Community College President Dr. Michael Chipps is a fan of a good quote. One in particular is, “To Infinity and Beyond,” a phrase coined by the character Buzz Lightyear in the Disney/Pixar animated motion picture, “Toy Story.” Chipps used the term to kick off the 2018-19 academic year during the Fall In-Service session recently that was attended by over 300 faculty and staff at the Norfolk-based college. 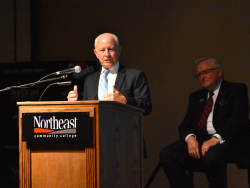 “Northeast Community College is moving ahead on multiple fronts and we are positioned to keep the momentum moving forward,” he said. During his State of the College address, Chipps provided status reports on a number of initiatives Northeast has undertaken that are based on the institution’s five-year Vision 2020 strategic plan. Now entering its fourth year, action plans have been developed by staff and faculty to correspond with the goals and objectives of Vision 2020 - increase student success, increase student access, provide a globally competitive workforce and develop and maximize resources. “We are here to strategically position Northeast Community College to be one of the best institutions in the country. Vision 2020 was designed and continues to be delivered to strategically position Northeast to achieve the mission of student and regional success,” he said. The 2017-18 Vision 2020 and Operational Action Plan Annual Report, presented to the Northeast Board of Governors earlier this month, indicated significant success in the completion of action plans, with many more on schedule for completion in the next-and-final two-year cycle. Chipps expressed his appreciation to the faculty and staff for the work they have done and continue do to educate the next generation of America’s workforce. Chipps’ sentiments were echoed by the head of the Nebraska Community College Association. Executive Director Greg Adams, who was a longtime educator and one-time Speaker of the Nebraska Legislature, was invited by president to address the Northeast employees. Adams said one of the many things he enjoyed about teaching was that instructors have the opportunity to start fresh at the beginning of each academic year. Chipps concluded the session with reflections on what Northeast has achieved as it begins its 45th year as a community college and how the community as a whole depends on the institution. Greg Adams, executive director of the Nebraska Community College Association, addresses faculty and staff at Northeast Community College during the College’s Fall In-Service session recently. Dr. Michael Chipps, Northeast president, (sitting) introduced Adams and provided a “State of the College” message to the employees.